The decline of two-party politics: might it be reversed on polling day? Over one third of the people who voted in the 2010 general election did not vote for either the Conservatives or Labour. 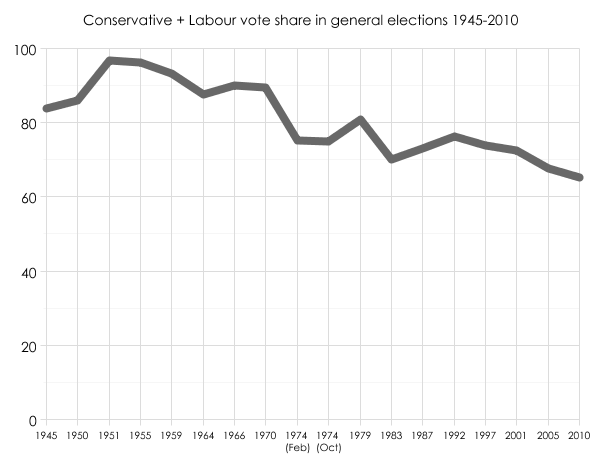 The two parties together managed a combined vote share of only 65.1%: the lowest figure at any general election since the war. The overall trend is downwards, with occasional interruptions. Whenever there has been a rise in the combined share, it has always been temporary and the trend has eventually returned to a lower point than before. The two brief upturns at the end of the 1970s and 1980s corresponded with an ebbing of support for the Liberal party and the SDP respectively. The decline has been continuous since 1992. Will it sink still lower in 2015? Current opinion poll averages suggest a combined Tory and Labour share of around 69%. Most of this is down to the collapse in support for the Liberal Democrats, only part of which is being offset by a rise in support in Ukip. For all the talk from commentators (and politicians themselves) of voters being disillusioned by mainstream politics, the polls suggest our two main parties are actually enjoying a small historical resurgence. One of the surprises of the 2015 general election may prove to be a rally in the fortunes of what Ukip likes to brand “the establishment”.